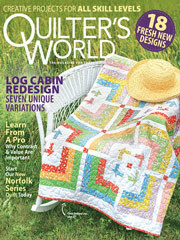 Sooner or later a quilter must face the test of accurate piecing. The perfect exercise for mastering hand or machine piecing is the Eight-Pointed Star. This quilt has six star blocks with additional 3" blocks used in the setting. Quilt Size: Approximately 39 3/4" x 54 3/4".